The King in the North finally has his Queen … and we’re talking about real life here. 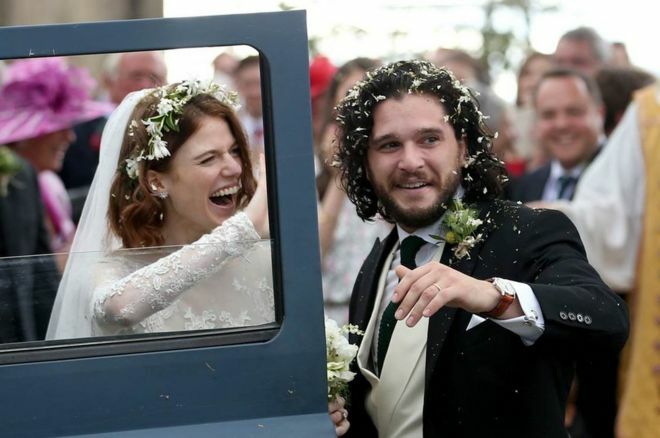 Kit Harington, aka Jon Snow from “Game of Thrones,” married Rose Leslie, aka Jon Snow’s former wildling lover Ygritte, in a ceremony Saturday at Kirkton of Rayne church in Scotland. Leslie’s dad — rocking a kilt — walked her down the aisle. The wedding was attended by several other ‘GoT’ stars — like Peter Dinklage, Emlia Clarke, Sophie Turner and Maisie Williams … and the celebration’s continuing at Rose’s family castle. That’s right — she’s a descendant of King Charles II … and her family owns a castle.